If you've never listened to the New York Dolls, this makes no sense at all, I'm sure. Let me fix that.. It's not my favorite by them (that would be "Personality Crisis"), but I was listening to it one night at work and the idea struck me to turn it into nail art...and here we are. I tried to get that odd glam/protopunk vibe going...tacky, clashy, and blunt. Young men dressed like deranged older women, that type of thing. It makes that much more sense if you've seen the cover of their self-titled album. Their clothes almost definitely weren't black and white, that's how I think of this cover. There are a lot of patterns going on here, but I simplified it to just polka dots and stripes. I stamped with Sally Hansen Whirlwind White over FingerPaints Black Expressionism. I used Bundle Monster plates BM-411, BM-018, and BM-022 plus the little plate from last year's Essence Stampy set. The lips are Sally Hansen Red-io Active, stamped with Bundle Monster BM-002. I forget where I got the studs, but I think it was through an Amazon Marketplace seller. When I said earlier that I was doing a theme week...well...you didn't expect the typical hearts and flowers, did you? First a bunch of mean little hearts and now a song that's at least half about heroin. What could be next? I love the lipstick on the 3rd nail in that is such a great idea! Great look for Valentine's Day but I love it even without the letters/lips on the top :) great mani in general and you've done amazing as usual! Oh my goodness! 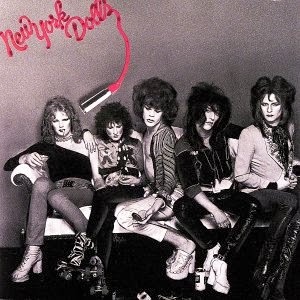 I haven't listened to New York Dolls in what feels like forever. I must change this now. Hope everything is well with you all!